The concept here is such a good one, it’s no wonder it’s become a TV show. It has a lot of appeal especially considering the likely direction our modern technology could take us. There’s potential for a tense thriller about being stuck in an alternate world gone wrong - as the 1973 film explores. But there’s also potential for stories involving the moral gray areas involving artificial intelligence and how easily it can all go wrong - as the new HBO series seems to be exploring. Michael Crichton’s directorial debut, 1973’s Westworld, is a combination of Disney World’s amusement park, made up of themed lands, and virtual reality’s gamification of immersively exploring alternate realities. Guests, for an expensive fee, can live out their fantasies of existing in a realistic western, roman, or medieval setting. The film introduces us to the idea of “Delos” the vacation of the future. The opening involves a sales video in which a man speaks with guests as they return from their visit. One man excitedly tells of how he killed six people in Westworld. It’s only after he hears the words exit his mouth that he realizes he needs to specify they weren’t real people. Much the way parents fear violent video games desensitize their children from real world violence, we might think this sort of immersive world, that encourages killing and romance, could cause misbehavior in the real world. Yet that remains entirely unexplored. However, once the robots start misbehaving causing real violence against guests, we realize the difference between what’s fake and what’s real. But before that happens we’re introduced to the themed lands and the background operations in ways the new HBO show didn’t (or hasn’t yet). It’s what we imagine Disney World to be like behind the scenes. Last year’s Jurassic World featured a similar setup filled with monorails transporting guests and employees sitting at workstations. We follow friends Peter (Richard Benjamin) and John (a young James Brolin who looks exactly like Christian Bale) as they visit Westworld for two weeks worth of romance and gunslinging. Of course there are a handful of other characters to check in on now and then to grant occasional perspective on other types of guests, but they amount to little else. The programmers of these worlds ensure regular events like bar fights and bank robberies take place to give guests something to participate in. Yet perhaps it’s telling the first programming failure is a female robot refusing the sexual advances of a male guest. 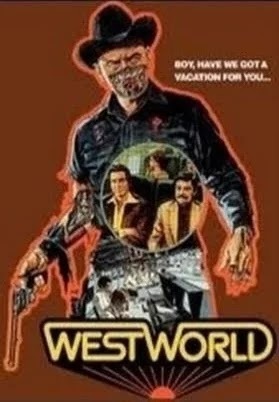 Soon after the safety protocols begin to fail allowing a swordsman to strike down a guest in Medieval World and Yul Brynner’s creepy gunslinger to begin an assault of terror on the unsuspecting guests of Westworld. It’s not hard, after seeing this film, to imagine where the inspiration for Jurassic Park came from. It represents yet another immersive theme park in which guests can explore a time long forgotten. That is, of course, until the creators lose control and their creations run amok threatening the tourists. It’s the reimagining of the biblical rebellion of mankind against God. The difference is the Jurassic Park franchise, and the HBO TV series even in just a couple of episodes, have sought to give a much deeper exploration of that premise. Crichton’s film is far less ambitious. That doesn’t mean it is entirely without merit. It does offer a unique vision into a potential future, and a fairly thrilling chase in the second half of the film. In fact the chase works well enough to redeem the lackluster nature of the rest of the film. It does so because of Yul Brynner’s chilling performance. He appears cold, detached, but determined. He moves with slow, assured, robotic efficiency. Now and then Crichton gives us his perspective. Seeing the world through his robotic vision was surely inspiration for John McTiernan’s 1987 film Predator. Fred Karlin’s effective score ratchets up the tension to another level. Yet Crichton’s lackluster direction tends to betray the tension with uneven pacing. His cinematic techniques are limited to the unique “gunslinger vision” and the occasional slow-mo shot during gunfights. Yet it works well enough to be worth the price of admission. Unexplored is the aftermath of these events or the simultaneous acknowledgment of what’s going on in the real world. Crichton leaves a lot on the table in terms of unexplored themes and dramatic possibilities. There’s also some laughably bad acting from time to time, particularly by Richard Benjamin. But for a first feature Crichton turned in a competent thriller whose concept is so good it had my imagination going more than the final film deserved. As such I’m excited to see where HBO, a continually excellent producer of compelling television, goes with the concept Crichton criminally under-explored. If you find yourself getting into the TV series, I’d recommend seeing this film. Have no fear, knowledge of where this film goes doesn’t seem to inform much in terms of the direction the series is taking.